"The 2013 Ambassadorial was very interesting and presumably the next one will be longer." the Minister of Foreign Affairs Maia Panjikidze said after the event ended on September 4th. The annual ambassadorial, which lasts for three days in Tbilisi, gathers members of the Georgian diplomatic corps and representatives of both legislative and executive authorities in the Radisson Blue Iveria Hotel to discuss foreign challenges and the means of implementing changes. Zurab Abashidze, the prime minister’s special representative for relations with Russia, presented his report on the latest developments in relations with Russia. He discussed the details of dialogue with Russia, talked about his meetings with Russian Foreign Minister Grigori Karasin and summarized the results that resumed negotiations have brought so far. Diplomats also had a chance to discuss the forthcoming presidential election with representatives of the Central Election Commission (CEC). 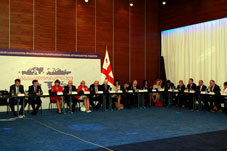 The parties spoke about ensuring that the election met international standards of transparency and fairness. According to the Minister of Foreign Affairs, the event was very fruitful, as representatives of all relevant government bodies had a chance to meet and discuss various issues relating to foreign policy. 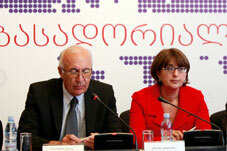 Prime Minister Bidizna Ivanishvili and President Mikheil Saakashvili addressed the participants on the closing day. Ivanishvili also answered some questions diplomats had for him. In his speech Saakashvili once again underlined his foreign priorities and thanked the diplomatic corps for their efforts in promoting the country in the international arena. However, the meetings of high ranking officials were held behind closed doors. "Overall I am very happy with this three day summit." Minister Panjikidze said after the ambassadorial closed. She added that positive steps in foreign development have already been made as a result of the ambassadorial.